It was 1 pm when I got to the Freedom trail head. There were 2 trucks parked one belongs to a Deep Creek regular. I saw 4 vehicles over on the Bowen Ranch parking area. There was no wind and no clouds and it was very quiet. When I got to the springs there were @ 25 people there. The first couple I met in the Womb pool had used their GPS to find the springs. It had taken them all day because at first they were told to go to the Bradford ridge. But the guy heard there was supposed to be a dirt road. So it took them a few hours driving around in S.B. before they found Bowen ranch road. They were very happy to finally be there. At 2 pm I was so bored I took my thermometer out to see how cold things were. 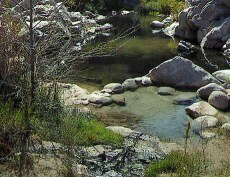 The Creek water just up stream from The Arizona Pool was 46 degrees. About 2 weeks ago it was 42. The creek water where most people cross the creek was 48 degrees. The out side air on the beach above the Arizona pool was 66 degrees. The Arizona pool was 107 degrees. I wanted to dig this pool out but did not because of a pulled leg muscle. It was less than 1 foot deep. The Anniversary pool was at 105 degrees. This pool was constantly full because it is so nice to soak in. The Womb pool was a very comfy 99 degrees. When I put my goggles on I search the bottom and found : 1 chewed on tennis ball, a mountian dew can and a silver wedding band. It is always fun to find jewely. It was sitting on the rock part of the bottom, waiting for me to find her. I felt like Gollum for a moment. Me precious. The Serenity pool was 107 degrees. Very clean and very nice. The Crab Cooker pool was 112 degrees as always. The Contemplation pool was still at 80 degrees. As the sun began to set I past the Bowen ranch and Mike was collecting his money at the gate. There were 3 cars parked in his drive way. As I continued on Bowen ranch road I saw at least 12 maybe 15 cars or trucks full of party animals and other assorted nature lovers. I guess people were planning on camping for the rest of 2013. I also past one of those very large RVs that appeared to be brand new. And you wonder ??? PS,If anyone lost a wedding band and can describe it I will send it to you.